Maximizing Progress: Evidence of Commerce ~ Obsidian Archeonomy! "Obsidian was once one of humankind's most sought-after materials, the "rich man's flint" of the stone-age world. This black volcanic glass fragments into lethally sharp, tough blades that, even after the invention of bronze, made it literally a cutting-edge technology. Because sources of obsidian are few and far between, obsidian artifacts are considered some of the earliest evidence of commerce: Long-distance movement of obsidian, even hundreds of thousands of years ago, suggests the early stirring of true trade. 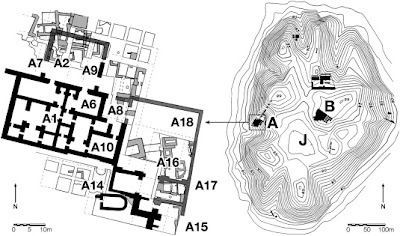 Differences in the trace elements in each volcanic source let archeologists trace the origin of individual obsidian artifacts and reconstruct trade routes. 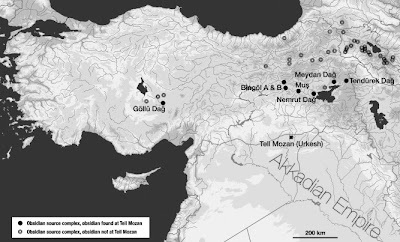 A new study [Environment and collapse: Eastern Anatolian obsidians at Urkesh (Tell Mozan, Syria) and the third-millennium Mesopotamian urban crisis] by Ellery Frahm of the University of Sheffield and Joshua Feinberg of the University of Minnesota, has used such obsidian tracing to shed light on how trade collapsed in the Akkadian empire of the early Bronze Age around 4,200 years ago in what is now northern Syria."